Triggers are objects in the world that can trigger a certain behavior. This can be to open a window, open a door, etc. A simple example of a trigger is a treasure chest. When the player clicks it the treasure chest becomes activated, the user can loot items, and when clicked again the trigger is un-used and the treasure chest closes. Input handlers are responsible for handling the input to use / un-use the trigger. This can be by the click of a mouse, tap of a finger, or the press of a (controller) button. The default TriggerInputHandler handles all 3 of these use cases. To use the trigger key codes your player / character will also need a trigger selector. The ITriggerInputHandler interface can be implemented into a custom component to handle the input for the trigger. You can also inherit from TriggerInputHandlerBase, which contains some helper methods. Your class has to inherit from MonoBehavour so it can be attached to the trigger as a component. Attach the following script to your trigger to handle it's input. You can also select it through the editor. A range handler is responsible for defining when the character that intends to use the trigger is in range or not. This can be a simple Vector3.Distance check, a Physics trigger, or something specific for your game type. 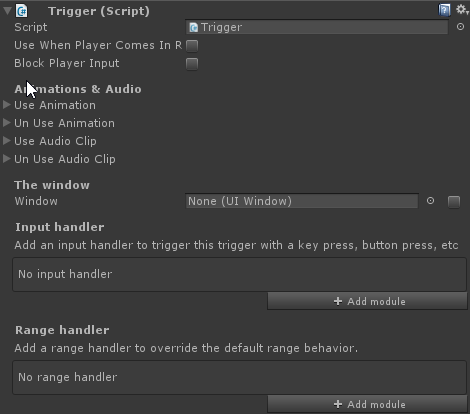 The default trigger range handler uses Unity's built-in physics system and creates a sphere trigger. This TriggerRangeHandler can only be used in combination with the 3D physics system. When you're building a 2D game, and wish to use the built-in range handler, you have to use teh TriggerRangeHandler2D; This is because the regular range handler uses a 3D sphere trigger, which is not compatible with 2D physics. The ITriggerCallbacks interface defines a component that can receive callbacks when the trigger is used or un-used. Attach the script to your trigger so it will receive callbacks. Your class has to inherit from MonoBehavour so it can be attached to the trigger as a component. // Do something here, like playing an animation on your character.